The University of North Carolina Press’ Enduring Editions use the latest in digital technology to make available again books from our distinguished backlist that were previously out of print. These editions are published unaltered from the original, and are presented in affordable paperback formats, bringing readers both historical and cultural value. 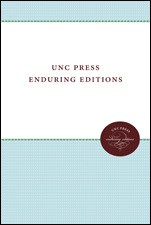 UNC Press Enduring Editions are produced in limited quantities according to customer demand and are available through select distribution partners. We are proud to re-introduce these classic works to a new generation of scholars, students, and general readers. View our full list of Enduring Editions titles.